This week’s theme is V, for Valletta. 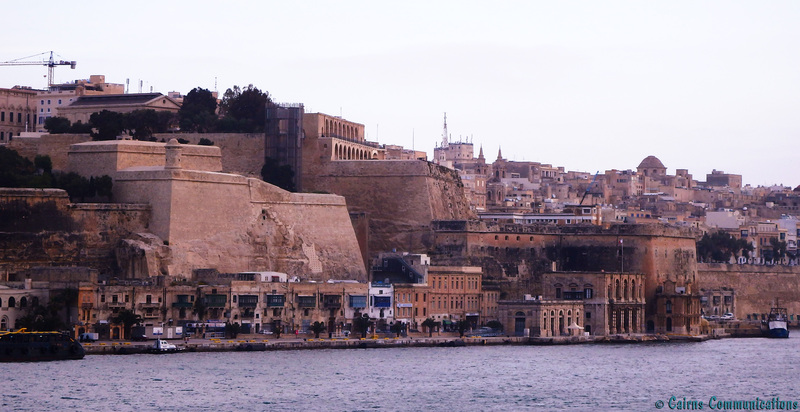 The city of Valletta was built, as we’ve mentioned, in the mid 1500s after the Great Siege by the Ottomans. The Turks had set up on what is now Valletta and bombarded Fort St Elmo – eventually they were repulsed, but not until the fort had been all but destroyed. The Knights of St John Hospitaller who ruled Malta pledged it would never happen again, so they built a new city at Valletta, and surrounded it by a maze of walls, curtains, bastions and cavaliers – called the Floriana lines, after the designer, Pietro Paolo Floriana. Since then, those fortifications have been extended, improved, expanded and modified – after every siege (or conquest), new fortifications were added. For example, in the centre of today’s Travelpic is the Lascaris Battery (built in the 1800s by Britain) – with the Kalkara Battery and curtain to the left, and the Marina curtain to the right. For those that want more info, when in Valletta make sure you check out the fortifications interpretive centre, about a km away.